Hey there, sugar. Caro Lamont here. Does your family drive you crazy? I have got to tell you that mine does. And I live thousands of miles away from most of them. First there’s my mama, bless her heart. I love her. Of course, you love your mama, but that doesn’t mean she doesn’t make you crazy sometimes. The latest bee she has in her big bouffant bonnet is that my friend Sam should come to Texas for a genuine Texas barbecue. Sam is Greek and, well, he has no idea what he’s in for. And I don’t just mean the food. Then there’s my cousin, Melinda. What can I say? I love her, too. We were very best friends as kids, but then as we grew up things got complicated. Now, though we both live in Laguna Beach, California (not a big town) we haven’t spoken in months. It’s partly a misunderstanding, partly a disagreement over a family brooch, and mostly good old Texas stubbornness. It runs in the family. I really want to believe I can be the better person, take the high road and all that, but then just when I think we can have a heart-to-heart and sort things out, something happens. Cousin Mel’s latest lapse in judgment has me beyond frustrated. If the girl would just ask for help! But will she? Oh, no. She’s so dang independent and always thinks she can handle things on her own. I won’t go into all of it but let’s just say that I think when you know all the details, you’ll see what I mean. What about you? Do you have family members that make you crazy? Do share. We won't tell. You can read more about Melinda’s “latest lapse in judgment” in Sparkle Abbey’s upcoming book, Raiders of the Lost Bark. It will be out March 25 and is available for pre-order now. 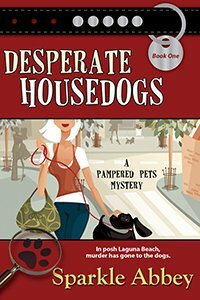 And if you missed the first book in the series or would like to gift a friend with the book that started Caro and Mel's adventures, Desperate Housedogs is only 99 cents in all ebook formats for the next two days! Sparkle Abbey is actually two people, Mary Lee Woods and Anita Carter, who write the national best-selling Pampered Pets cozy mystery series. They are friends as well as neighbors so they often write at ML’s dining room table or at the Starbucks up the street. If they could write anywhere, you would find them on the beach with their laptops and, depending on the time of day, either an iced tea or a margarita. They chose to use Sparkle Abbey as their pen name because they liked the idea of combining the names of two of their rescue pets, Sparkle (ML's cat) and Abby (Anita's dog). 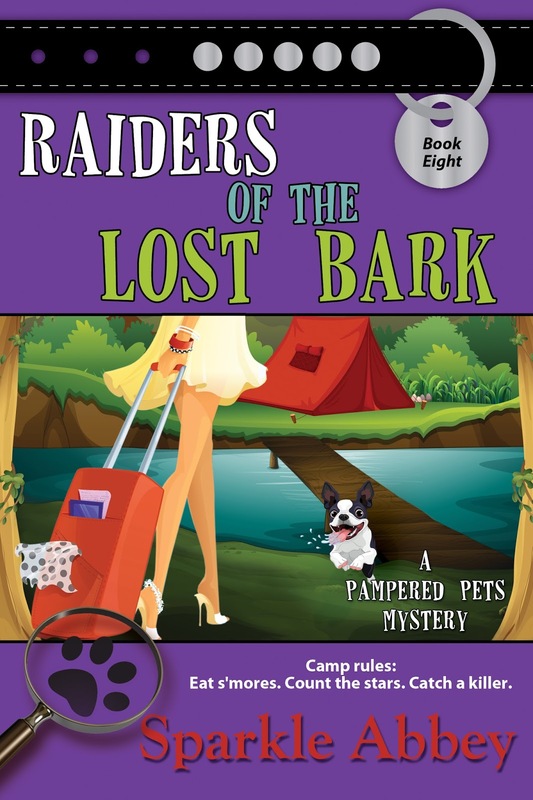 Raiders of the Lost Bark is the eighth book in the series. The authors love to hear from readers and would love to connect with you via their website at: sparkleabbey.com or on Facebook or Twitter. Would you like to get updates about appearances, specials and new releases? Subscribe to Sparkle Abbey's mailing list. No one all the time, but each of them occasionally. Yup, a sister that never had children and now likes to claim my daughters as her own or as her BFF. And then acts like I am just the neighbor down the street. I enjoyed the first book and look forward to reading the second one. Oh and my family. Well, let's just say The Royal Family does not have the market on dysfunctional. The stories I could tell. But, I just might get sued or worse.